There are two sides to every story; but when you run away from your family only one story remains. And that story, retold by the people you have hurt and horrified, becomes embellished and embroidered. You leave behind memories of your shortcomings and your mistakes, and you take the good times and the character strengths with you in your suitcase. Or that, at least, was what seemed to have happened with Prim. Saddest of all, as I was to discover, your story stops on the day you leave. What happens to you next – however brilliantly you do, whatever you make of yourself – happens in a parallel universe that your family are not connected with, not interested in, and not even aware of. And yet, family never ceases to matter; genetic bonds, even ones that have been neglected for decades, cannot be severed. So when Prim opened her door to me in October 2006 in Mexico City, 5,000 miles away from Lancashire where we both grew up and 60 years after she left it behind, I realised something completely unexpected. I had come to look for her on a whim, after a chance conversation about how renowned an artist she had become in her adopted country. I am a journalist, always on the lookout for a story – and what a story this one sounded. My father’s renegade cousin, when I researched her life online, had not simply run off to be an artist’s model, as my grandmother had once told me: she had left for love, the love of one of the greatest artists of the 20th century, Max Ernst. And with him she had been at the heart of the surrealist movement in Paris in the 1930s. When the second world war divided them, she had been incarcerated for a while in a Spanish asylum; and then, by way of more adventures, she had gone to Lisbon where she married a Mexican diplomat, and journeyed on with him to his country. 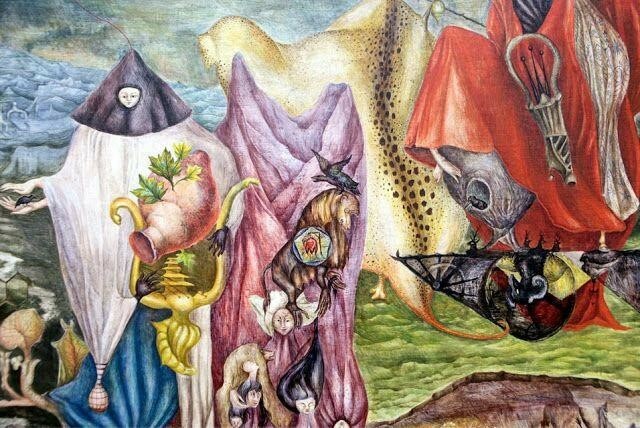 But there, where the family story stopped, the rest of Prim’s life continued: over the next six decades, based sometimes in Mexico and sometimes in the US, she had been at the heart of a small, female surrealist cell. She had painted canvases and created sculptures and written short stories and novels: she had become our family’s unseen (by us) Renaissance woman. For decades she had been relatively unknown: the mainstream art world had passed her by, and the dealers neglected her. But then, in her eighth decade, she had slowly but surely found fame. Her work had been rediscovered by art historians; female surrealists had been “reclaimed”, acknowledged for their individual talents rather than their role as muses. And by the turn of the 21st century, she had become in her adopted country a kind of national treasure – feted, admired, and honoured for her extraordinary achievements. It was a cracking tale, and I tracked Prim down in the hope of hearing more about it, and telling it in this newspaper. But in that moment on her doorstep, and in the days that followed, I realised to my surprise that my expedition to find my long-lost cousin had very little to do with journalism, and a great deal to do with being family. I could see traces of my father and other relatives in her face, her mannerisms and – especially – in her sense of humour, and I sensed that she felt a similar connection with me. Unlike most people I interview, with whom I have to create a bond, with Prim the bond was already there; I didn’t have to try at all. And, I discovered, I was thrilled not to be a journalist. I wrote my piece about her but then I went back to see her again – and again, and many more times. To give me an excuse to make all these visits, I hatched a plan with a gallery in the UK for an exhibition – the first show of her work in her native country for 20 years – with me as its co-curator. I rode out the storms of protest at home from my husband and our four children – “What? You’re going to Mexico again?” – and pitched for work that was portable, jobs I could do in my hotel room at 5am before heading round to Prim’s at noon. And after a while I stopped asking her about her life with Ernst, and with Picasso and Dali and Duchamp and Miró, because I was interested less in what she had beenthan what she had become. Her fame in Mexico, by now, was obvious. Sometimes we went to a smart restaurant together, or to an exhibition opening: and when we did she was the centre of attention – the eccentric English artist dressed entirely in black, whose strange and eerie paintings drew on her European past, but were also intrinsically bound up in her Mexican present. Most of the time, though, we did ordinary things together – drinking cups of tea at the kitchen table, making trips to the supermarket, enjoying tamales at the cafe round the corner, sipping glasses of tequila after supper. Prim had had her own family in Mexico: two sons, whom I have also got to know over the last decade. She had grandchildren too, though some lived abroad; but what she didn’t have, having given them up so many years before, was an extended family. And so, in the time we shared together, they were the people I tried to represent: people like my grandmother and other family members who had loved Prim – I am quite certain of that – but who had puzzled over her choices and her actions, and never really understood them. And in the end, I like to think, that is what I did for Prim, our family’s ghost: I listened to her story. I didn’t understand everything, of course (“I am as mysterious to myself as I am to others,” she once said) but I heard her out, and I learned. I did it for myself, because I recognised her as someone with a great deal of wisdom, someone who tapped into some of the deeper reaches of the human experience; but I also did it for all those relatives she had left behind. I listened to why she had to leave; why she felt constrained and restricted, like the mummified woman in her painting Green Tea, and how she knew that if she was to live out her destiny as an artist, the only choice was to get away. The very first thing she told me was in one sense the most important thing she ever told me. She was, she said, no longer Prim: she had left Prim behind, and had gone back to being who she had originally been, before the family nickname took hold – Leonora. So I always called her Leonora: in doing so I was honouring not who she had been in our family, not the ghost, but the brilliant and complicated and talented artist she had become in the world: the renowned Leonora Carrington. But the funny thing is that, since her death in 2011, I find myself thinking of her sometimes as Leonora, and sometimes as Prim. I like to hope that perhaps the two personas were eventually reconciled. The odd thing about her work, given that she had cast herself out and travelled halfway around the world to get away from us, was that her childhood and her birth family were a constant frame of reference, returned to again and again in her paintings and her writing. Leonora went a long way to get away from Prim; and yet Prim gave Leonora the material for a lifetime. That was a bitter irony that would certainly not have been lost on her. And then there is the irony that I, a member of the family she abandoned, have ended up spending a decade of my life trying to champion her work. Perhaps, in the end, the most important thing I did was simply to be proud of her: proud of her on behalf of all of us, the family she left behind. I like to hope too, though I have no right to make this assertion on her behalf, that I restored some smidgeon of faith in a link she had both tried to sever, and remained inextricably bound up in. But this much I know: she trusted me (not a sentiment she expected to feel towards a member of her family), and I trusted her. In her kitchen in Mexico City, six decades after the seismic split that separated her from our family, we rekindled something precious and meaningful, something that connected us to one another because of the roots we shared.